In honor of National Archaeology Day, October 20, 2012, the AIA-Milwaukee Society, together with the Archaeological Research Laboratory at the University of Wisconsin-Milwaukee, sponsored an Archaeology Lab open house on the theme of “The Archaeology of Food and Drink.” Archaeologists from UW-Milwaukee, Marquette University, Discovery World, and the Milwaukee Public Museum presented displays and hands-on demonstrations designed to illustrate how peoples in several different cultures procured and prepared their food and drink. About 50 visitors, young and not so young, sampled a variety of tasty Maya, Celtic, Roman, and Kwakiutl treats. 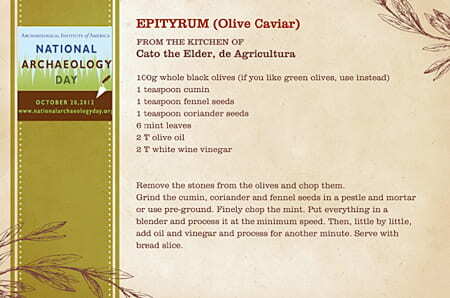 Bettina Arnold, Anthropology, UW-Milwaukee, provided Roman Mustacei with Epityrum (must rolls with olive “caviar”) adapted from recipes by Cato the Elder. 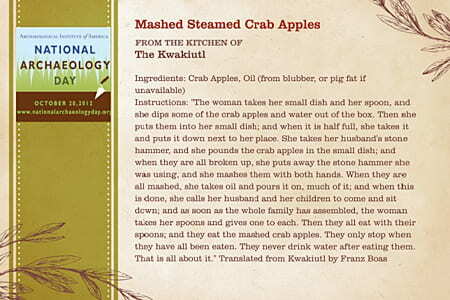 Shannon Freire, Anthropology, UW-Milwaukee, demonstrated how to mash steamed crab apples with a stone to make a Kwakiutl dessert, from a traditional recipe, first published by anthropologist Franz Boas. Young visitors could also try their hand at grinding grain the prehistoric way under the tutelage of Jane Peterson, Anthropology, Marquette University. This being Milwaukee, beer was an important theme. 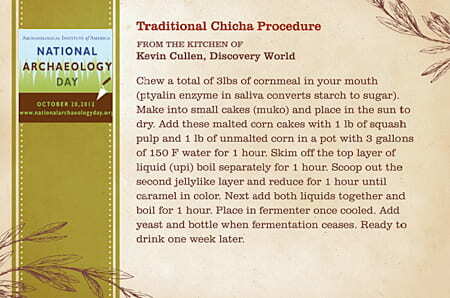 Kevin Cullen, Discovery World, demonstrated how to begin making your own Chicha (Meso-American maize beer) by chewing on corn meal. 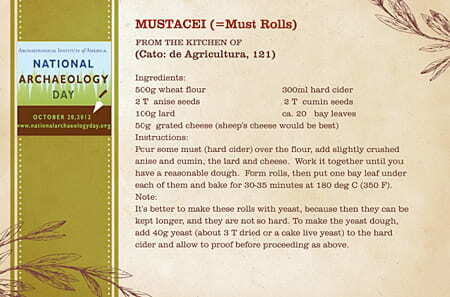 Sarah Bond, History, Marquette University, explained the role of cervesarii (beer brewers) in Roman society. More subtle clues to diet can be detected by examining things like animal and human bones and ancient pottery containers. Jocelyn Boor, Milwaukee Public Museum, showed how the technique of X-ray fluorescence could detect residues of what was once stored in a pottery vessel. 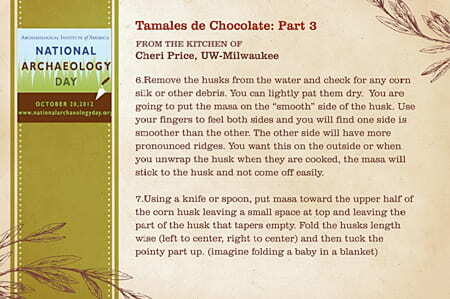 Jean Hudson, Anthropology, UW-Milwaukee, demonstrated how to reconstruct ancient diet from animal bone remains; and Adrienne Frie, Anthropology, UW-Milwaukee, explained how poor nutrition in life shows up in bones after death. Participants and visitors alike had a great time exploring these aspects of the Archaeology of Food and Drink. For more on National Archaeology Day and to see what other AIA local societies and archaeological groups did, visit http://www.archaeological.org/NAD/.